BioFit Engineered Products, a globally renowned manufacturer of specialized ergonomic seating solutions, introduced a cross section of its latest technical seating models today at the opening of NeoCon 2017. Headlining the company’s exhibit are numerous designs from its flagship MVMT™ seating line, featuring the proprietary MVMT QR Code Profile System. Also highlighted are the Fin sit-stand and Neon chair from the bimos by BioFit Collection, which is available with optional logo imprinting to promote customer brands. Select specialty seating from the BioFit Foundation line is on display as well. Product demonstrations and consultation on key differentiators of specialized workplace seating will be offered by company representatives throughout the show. MVMT seating was developed for use in the technology, laboratory, healthcare and industrial sectors, and in standing desk applications. Jointly created with Studio Fifield of Milan, Italy, the line combines precision and durability with a style aesthetic not normally associated with traditional laboratory and technical workspaces. The line is available in two series, Pro and Tech. The MVMT Pro Series has 13 ergonomic functions to address task specific user range of motion, and both series feature the exclusive MVMT QR Code Profile System, the first technology of its kind in the commercial furniture industry. The system provides customers with handheld, digital access to usage videos, warranty and reorder information and other tools correlating to the exact MVMT chair purchased by linking to a unit-specific microsite. It was developed to enable end users to become quickly and easily familiarized with their new chair and serve as a handy reference resource. The bimos by BioFit Collection combines original design from European seating leader bimos with the proven ergonomic tradition of BioFit. The line’s lead model, Neon, features a quick-change replaceable upholstery system and was developed primarily for use in technology, laboratory, educational, healthcare and industrial workplaces. BioFit also offers a logo imprinting capability on the Neon, providing customers with the option to individualize their seating with their corporate brand. 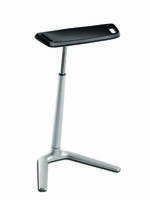 The swiveling Fin sit-stand from the Collection is also on exhibit. Fin was developed for tasks requiring prolonged periods of standing. The BioFit Foundation line is comprised of specialty, task and multipurpose seating. Models in this line are designed for use in settings as diverse as clean rooms and static-control environments to food processing facilities, training centers and offices. 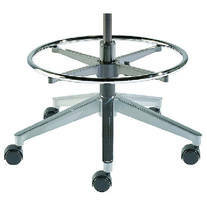 Located in Bowling Green, Ohio, BioFit Engineered Products is a leading manufacturer of LEED - compliant ergonomic chairs and stools, GREENGUARD Gold-certified mobile tables, carts and accessories for healthcare, education, laboratory, industrial, technology and office environments. Visit BioFit booth #7-9070 at NeoCon, June 12 – 14, at The Mart in downtown Chicago to experience the company’s latest products. For more information, visit www.biofit.com or call 800.597.0246.